Complete the form below to be sent your insured FREEPOST Watch Repair Envelope. At W.E. Clark we understand the specialist nature of dial restoration, which is why all of our watch restorations requiring dial work are referred to a specialist dial restorer. While our Master Watchmaker gets on with any mechanical and case restoration, the dial is sent to one of the country’s leading dial restorers for meticulous restoration work. We are proud to have forged a very strong and successful relationship with one of the UK’s leading family dial restorers, so we are confident we can promise exceptional dial restoration for almost all watch dials. The dial restorer’s work begins by taking a photo of the original dial, before it is cleaned and prepared. The dial is then matched with one of numerous in a library of dial plates. It may not be possible to match a dial plate to the exact original specifications, but it will be as near a match as is possible. In most of the dial restoration work we refer, the typeface match is perfect. Sometimes specialist transfers are used to replace the original logos and wording. These are sourced from a huge library that is used to match as closely as possible to the original. Our aim is always to restore the watch back to its original state, as close in detail as we can possibly get. Once a replacement dial plate is matched as closely as possible, surface work is carefully carried out for achieving a perfect finish. The dial restorer has a wide catalogue archive of plates, with differing typefaces and logos, carefully matching the nearest to the original which is selected for application to your dial. Once this has been applied to the dial, watch dial writing, logos and numbering is reapplied. Finally, batons or numbering is re-attached to the dial. The dial is then returned to our Master Watchmaker to be re-instated in its case. We would point out that this is a dial restoration service, and not there will always be slight differences to the original dial, due to the fact that the new dial is applied by hand. We will always discuss this with you first and explain any minor differences, and make sure you will be 100% happy with the outcome of the dial restoration. This painstaking and delicate work requires very specialist metalwork skills, including engraving and painting. It is why we have chosen to work with a dial restorer who has a reputation for completing the most magnificent dial restoration work. Take a look at one of the recent projects completed by our partnering dial restorer – a vintage Tudor watch repair with dial restoration - and you’ll see the kind of results we always aim to achieve. Your antique or vintage watch is safe with us from start to finish. We will carry out every wrist or pocket watch restoration with the utmost sensitivity and expertise to make sure your prized timepiece is returned to you in perfect condition. We are confident you will be delighted with the results, but for peace of mind we offer a minimum 12 month guarantee for all work undertaken. 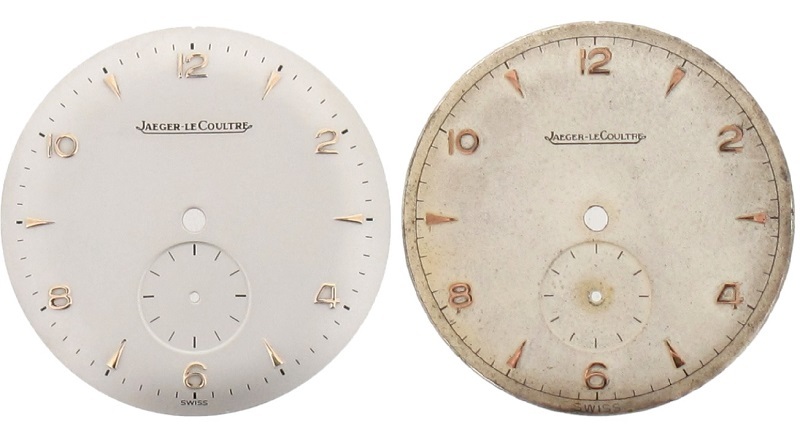 Our dial restoration service is second to none. You can ship your timepiece to us from anywhere in the UK using our Royal Mail Special Delivery FREEPOST service. Your watch is insured for up to £20,000 throughout its postal journey, from the moment the package leaves your hand to when it is posted back to you. Before we commence any repairs, we will discuss the work required and the costs with you first. Antique and vintage dial restoration at W.E. Clark couldn’t be easier. We would love to restore any dial on any antique or vintage watch, as near to the original as is possible, from anywhere in the world. Outside of the UK you will have to organise shipping, other than that you can expect the same high quality repair service. Feel free to bring your timepiece into our Lewes and Uckfield showrooms. We would love to meet you and discuss your dial restoration requirements with you.